Make your own homemade Caspian Sea Yogurt with Matsoni yogurt starter while benefiting your diet. Natural remedy for constipation in the Caspian Sea Yogurt diet. Making homemade yogurt from Matsoni Yogurt Starter is one way to diet on a budget eating the Caspian Sea Yogurt celebrated by health food fanatic in Japan. The Caspian Sea Yogurt is the sourdough of the yogurt diet. What is Caspian Sea Yogurt? The right diet for you is that which feels right. Eating Caspian Sea Yogurt not only remedies constipation but may even help you lose weight. Being constipated slows down your metabolism making it easy to gain weight. In addition when you add Caspian Sea Yogurt to your diet you can put a stop to dry skin and stiff shoulder with healthy probiotics. 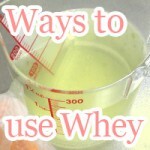 As well as lending power to your diet, it is a great health and beauty product. In this daily take on Slism, we introduce the Caspian Sea Yogurt diet in all simplicity going over the many benefit of eating yogurt you get from Caspian Sea Yogurt finishing with workaround to get you moving forward with ease. The Caspian Sea Yogurt diet is where you eat Caspian Sea Yogurt for breakfast, after dinner as a desert. Ideally, you want to eat no more than 100-200 milliliters of Caspian Sea Yogurt per sitting. Note that it is more important to continue eating versus eating large amount per meal. On the Caspian Sea Yogurt diet there are no restrictions on the foods you eat. However, that doesn't mean you can overeat. The volume of Caspian Yogurt you eat will not guarantee quick results. More importantly, keep on eating keeping in mind to keep it bellow 80. As good as eating Caspian Sea Yogurt for breakfast sounds, acidity doesn't sit well on an empty stomach. In extreme cases, you may run the risk of damaging your stomach. This is why when choosing to eat Caspian Sea Yogurt, it is best to do so not on an empty stomach. Like many other health food there are great benefits you get out from incorporating them in your diet such as lowering cholesterol, improving bowel movements, and keeping your skin look young as ever. When you enter the middle age, eating Caspian Sea Yogurt daily may be the one of the reasons you get ask What's your Secret? The main reason why eating Caspian Sea Yogurt is said to promote weight loss is that it contains lactic acid said to promote healthier gut flora. By improving your intestinal environment, you have less to worry about when it comes to bowel movement related problems in your diet. Some say constipation makes you fat. The fact is that unwanted bodily waist building up in your system is not everything. Being constipated slows down your metabolism making it hard to lose weight. Skipping meals or going on a diet too restrictive of the foods you eat is one way to become constipated. Being able to remedy constipation by dieting is an attractive natural remedy to try. Being constipated caused the number of so called "bad" bacteria to increase in your intestines affecting all corners of your diet including skin care. This is why when dealing with constipation your skin tends to dry up. Bad bacterial in your gut leads to the creation of toxins that gets sent out throughout your body causing dry skin. Treating constipation from the get-go not only affects the age of your intestines, but also touches are like your complexion, keeping you looking young longer. Another great benefit to eating Caspian Sea Yogurt is that it boosts your immune system, something one should never throw away wishing to maintain health through the ages. It is said that just by eating Caspian Sea Yogurt and other healthy yogurts, the risk of cancer and developing infectious diseases lowers remarkably. Most people on the Caspian Sea Yogurt diet can be done economically by using yogurt starts such as those sold online. However, there is a minute problem with this. Hygiene management becomes an important issue. When making homemade Caspian Sea Yogurt, the room temperature needs to me moderated to exact precision to ensure best batch results. For this reason, making homemade yogurt during the summer and winter months only asks for spoiling under insufficient supervision. Be sure to sterilize material used in making homemade yogurt. Be careful where you place your yogurt for fermentation. Making it homemade from yogurt starter may be a way to economize your diet, but don't get too ahead of yourself. If you are going to do it right, do it right the first time. In the meantime, happy yogurt diet. 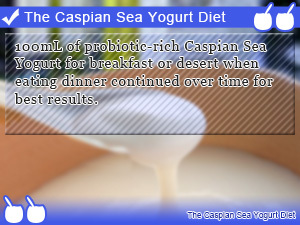 100mL of probiotic-rich Caspian Sea Yogurt for breakfast or desert when eating dinner continued over time for best results. 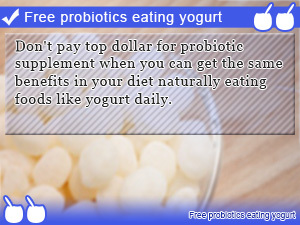 Don't pay top dollar for probiotic supplement when you can get the same benefits in your diet naturally eating foods like yogurt daily. 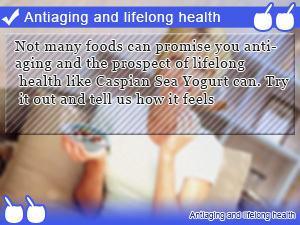 Not many foods can promise you anti-aging and the prospect of lifelong health like Caspian Sea Yogurt can. Try it out and tell us how it feels.